SAFETY FOREMOST! 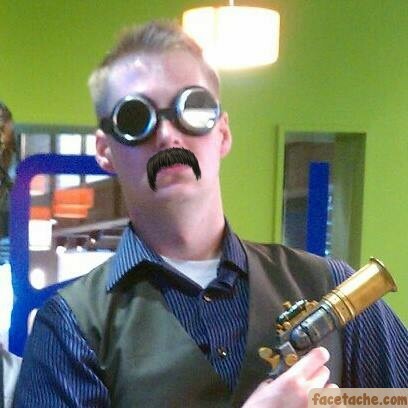 — Explosions, Inc.
Last week I introduced Ron Diefler in an article that was mostly an excuse to poorly photoshop mustaches onto pictures of Don because I am a mature adult. I originally created that mustachioed dynamo as a way of protesting instances when Don, in accordance with his duties, would prevent me from doing things that were likely to end up with someone getting hurt or incarcerated. 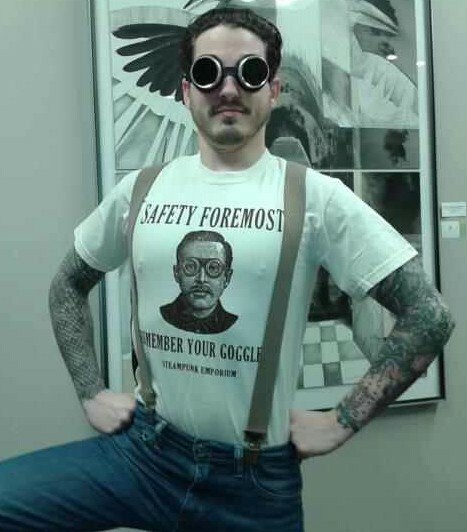 "Ron Diefler would let me make thermite at my desk. Ron Diefler would let me practice fire-breathing in the alley behind the science center. Ron Diefler would let me launch myself out of a giant catapult." (To be fair to Don, he was actually pretty okay with the catapult idea. It fell to another coworker to foil that particular plan). Ron Diefler, in my mind at least, would listen to my meanderings, calmly stroke his fantastic facial hair and say, "proceed." 5. Never, ever eat in the lab. Until the 1980s, the accepted science was that stress and lifestyle choices were the driving factors behind stomach ulcers. Seeing as how that conclusion had been reached by repeatedly dropping rats wearing straitjackets into ice water, who could argue with that logic? Prompted by an opportune meeting between Barry Marshall and Robin Warren, a pathologist who had found the H. pylori bacteria in many biopsies of patients with ulcers or stomach cancer, they advanced the hypothesis that a bacterial infection could be the true culprit. Since mice didn't prove a good host for the H. pylori bacterium, Marshall decided to play the role of lab rat and drank a concoction made from the bacteria taken from the stomach of a patient. Sure enough the bacteria rejoiced in their good luck, threw a party, and began eating holes in Marshall's guts. Fortunately Marshall had the foresight to determine ahead of time what drugs were necessary to kill H. pylori and not only did he cure himself and many others, he and Warren shared a 2005 Nobel prize for their willingness to drink infected stomach juice. 4. What, are you stupid? DON'T EAT IN THE LAB! Way before Barry Marshall decided to down a stomach bacteria cocktail, Stubbins Ffirth (that's a real name) entered the University of Pennsylvania a few years after the Yellow Fever Epidemic of 1793 killed thousands. Noting that the outbreaks waxed in the warm months and waned in the winter, Ffirth got the idea that rather than being contagious, the fever was a result of heat and stress. Like Marshall, Ffirth had no way to test his hypothesis safely and instead elected to prove his point by smearing vomit from yellow fever patients onto cuts on his arms and into his eyes. Not feeling reckless enough apparently, Ffirth got creative and fried up some infected vomit and inhaled the fumes. Finally he decided his party trick would be drinking entire glasses of black, infected vomit. To give him his due, Stubbins Ffirth did not contract yellow fever. However, his hypothesis was ultimately incorrect as he had been using vomit from late stage yellow fever sufferers who were well past the point of contagion. When a military pilot takes to the sky, he or she is expected to endure an increase in gravitational forces (known as G-force) up to 9 g for as much as a minute. An untrained person might immediately black out when the g-forces reach 5 g. Up to around the time Chuck Yeager broke the sound barrier, it was accepted wisdom that the threshold beyond which a human would die when accelerating or decelerating was 18 g.
Enter medical doctor Capt. John Paul Stapp. Not happy with the status quo for testing g forces, Stapp stepped in for the crash test dummy and, on a rocket powered sled with four engines combining to give 6,000 lbs. of thrust, endured gravitational forces of 35 g. In 1954 he decelerated from 120 mph to zero in 1.4 seconds. The sudden stop broke his back, arm, wrist, knocked out six fillings, gave him a hernia and blinded him for two days. But he walked, well maybe crawled, actually was probably carried away from the experiment. And he wasn't done yet. Stapp had plans to repeat his performance at Mach 1 and again at 1,000 mph before human tests were finally suspended. Continuing on the theme of getting a bright idea and willfully ignoring all current wisdom and safety protocol, Werner Forssmann made great strides in medical science by stabbing himself in the heart. On purpose. In 1929 Forsmann was a surgical trainee when he got the idea that a catheter could be inserted into the heart to inject medications or dyes or maybe just for laughs. Forbidden from the procedure by the department head, Forsmann convinced an operating room nurse to help him. While she was under the impression the procedure would be carried out on her, Forsmann instead gave her a sedative, shackled her to the operating table, then made an incision in his own arm and threaded a catheter into the antecubital vein. At this point he released the nurse, walked to the x-ray room, and finished pushing the catheter into his right ventricular cavity with the help of a fluoroscope. Understandably the department head was a bit miffed. 1. THE GOGGLES, THEY DO NOTHING! As Anatoli Petrovich Bugorski found out in 1978. He was working at the Institute for High Energy Physics in Protvino, Russia. Their Synchrotron U-70 was malfunctioning and, as Anatoli stuck his head into the guts of the machine to suss out the problem, he took a proton bullet through his brain. Despite having the beam burn through his skull and brain tissue, and despite the proton beam measuring 400 times the lethal amount of radiation for a human, Bugorski only suffered hearing loss in one ear, facial paralysis on his left side, and developed mild seizures in later life. He even earned his PhD although I can imagine his dissertation defense involved a lot of pointing and laughing on the part of the PhD panel. …and a bunch of “don’t go into the light” jokes.